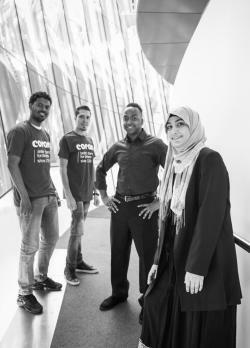 Coram believes that young people can change their own lives and the world around them by making a difference as young ambassadors, peer educators and volunteers. Our youth projects place young people at the heart of our organisation, co-producing and delivering solutions to the issues they face. With ongoing training and support, they are given the skills and confidence to get their voices heard and effect change. Speak Out!, a project with the National Theatre for young people. Coram Voice, which includes A National Voice, an organisation working to amplify the voices of care experienced children and young people. LawStuff, a website developed by young people to help them better understand their legal rights. Find out more about the 2018 Voices writing competition!